Urban Initiatives – PArty Time: Meet Alexandra! 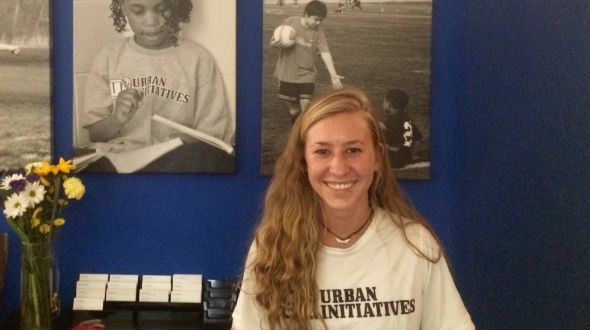 Please give a warm Urban Initiatives welcome to Coach Alexandra, our new Program Associate from Lubbock, Texas. A few years ago Alex set out on her first adventure to see the world outside of her hometown. She went off to the beaches of St. Petersburg, Florida and attended Eckerd College. Alex double majored in Environmental studies and Spanish and minored in Visual Arts. Through several study abroad opportunities and the influence of a great mentor she developed a passion for non-for-profit organizations. While living in St. Petersburg, Alex recalls how much she enjoyed working at a daycare for young children of local migrant worker’s. This experience sparked a flame in her heart for working with youth in the non-profit world. So you can only imagine when the chance to work at UI presented itself Alex was eager to pack her bags and set off on her next journey in the great city of Chicago, IL. Although she does not play much these days, Alex used to enjoy playing tennis. These days she jumps at the chance to do “Pure Bar” Yoga and Pilates. In her free time Alex loves to do freelance photography and sing in the shower! She recalls some of her best memories from singing at “The Cactus Theater’ in Lubbock, Texas. Alex loves spending time with her friends over a delicious taco dish. You may also catch her snacking on some French fries and ice cream. Alex is most excited about building relationships with the UI staff and kids she will be coaching. So do not hesitate to grab your favorite flavor of ice cream and get the “scoop” on this “southern belle.” One thing that most people do not know about Ms. Alex is that she snuck a dog back home from her trip to Nicaragua. Lastly, Alex will sing it loud and proud that her dad, who is a pilot by day and golfer when time allows is her #1 hero! Previous Article: PArty Time: Meet Eugene!